We are delighted to invite you to a new free open community ‘Mindsets: Information, Digital & Media Literacy’: http://eepurl.com/ge1caT. ‘Mindsets’ is available via OneHE, a global network for educators who share a passion for learning and teaching in higher education: https://globalnetwork.onehe.org/. 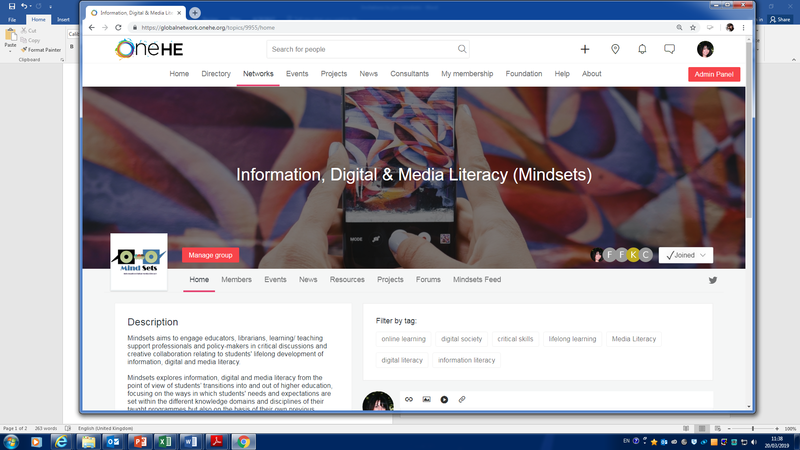 ‘Mindsets’ aims to engage educators, students, librarians, learning/ teaching support professionals and policy-makers in critical discussions and creative collaboration relating to students’ lifelong development of information, digital and media literacy. ‘Mindsets’ explores information, digital and media literacy from the point of view of students’ transitions into and out of higher education, focusing on the ways in which students’ needs and expectations are set within the different knowledge domains and disciplines of their taught programmes but also on the basis of their own previous educational, work and everyday life experiences. We discuss ideas on how to address synergistically students’ digital inequalities, created by socioeconomic differences and other life situations, and we explore ways in which information, digital and media literacy HE based plans and objectives can be more inclusive for all. We would like to create a vibrant community and invite all voices and perspectives. Ideas for the network have included a) adding monthly themes, where different members can contribute towards a co-authored single document that can then be published across the wider OneHE network of educators, acknowledging members’ contribution; and b) establishing a ‘mentors and mentees’ approach on areas of interest/areas members would like to develop for the purposes of professional recognition and continuous professional development. Please join to find a home for all topics related to information, digital and media literacy and make this your own group! ‘Mindsets’ will run its first webinar (details below) taking place on 30 April 2019: Students’ everyday life digital mindsets: transitions into higher education The webinar will be presented by Dr @Konstantina Martzoukou (Robert Gordon University, Scotland), Dr Crystal Fulton (University College Dublin) and Dr Petros A. Kostagiolas (Ionian University, in Corfu, Greece). Full details and presenter bios are available on the booking page, with an overview below too. This free webinar is open to members and non-members, so please do share with colleagues and networks that you think might be interested. Webinar brief overview: Previous research has found that not all university students are equipped with digital competencies for lifelong learning informed digital citizenship and the digital economy when entering Higher Education. Students transfer into their educational environments self-taught digital behaviours, learned via experiences in the everyday life setting. The dichotomy of digital natives and immigrants based on demographics only, is a simplistic way of addressing this issue. There is a need to holistically explore everyday life experiences of students brought into education from an increasingly interconnected and changing everyday life digital world and improve communication and collaboration between academic faculty, the library and academic support units. This talk will present current research conducted by the presenters to address gaps in this area, via a survey of students’ digital competencies. The talk will also present the development of the new thematic open group in the OneHE network, ‘Mindsets: Information, Digital and Media Literacy’ which aims to promote a culture of sharing and openness, placing emphasis on fostering international partnerships and collaboration for the digital inclusion of all students. The webinar will be for academics, practitioners and researchers working in the information literacy, digital literacy or media literacy domain and are interested in students’ everyday life digital experiences and how they relate to higher education learning and teaching. And also to those who are interested to collaborate with others to enhance students’ digital literacy and competencies.